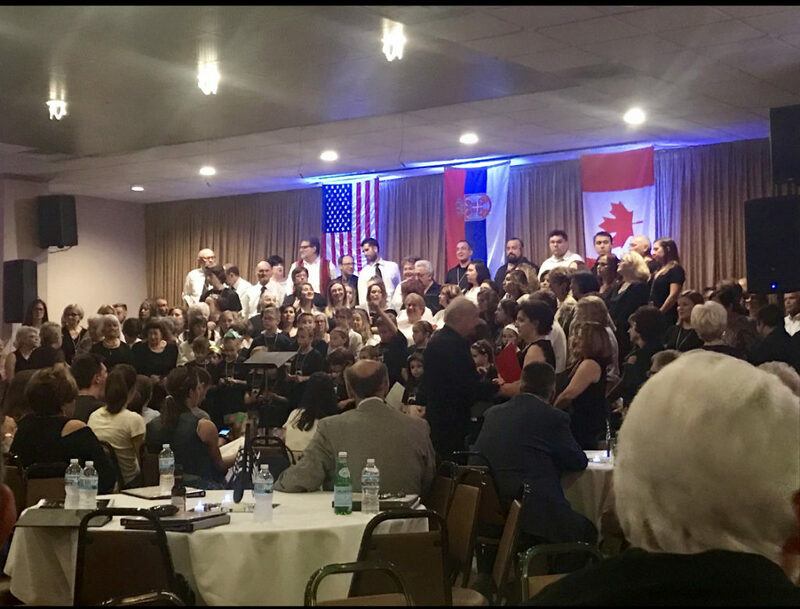 This year's SSF Choir Festival was hosted by the St. George Serbian Orthodox parish in Joliet, Illinois during Memorial Day weekend, May 25-27, 2018. This important year gathering of choirs began on Friday, May 25th with all needed preparations, registration of choirs, a welcome prepared by the host choir, dance with live music and other activities. Member of the host “Mita Topalovic” choir created a sincere and welcoming atmosphere which was noticed by all immediately. This was the introduction to a very impressive two-day gathering of choir from as far East as Boston to as far West as Phoenix, and north to Misisaugua – Toronto. The warm – more summer than spring – days brought life to the already exiting atmosphere, like the feeling that we all belong to one family, the Orthodox faith and Serbian nationality. I ask myself, who wouldn't feel excited in such a setting. Thank God for one more manifestion of Serbian faith and the national spirit. Choir members slept in Saturday morning after the Friday late night welcome, using their free time to finish personal tasks because when the program begins in the afternoon it will be filled with activities. Already at noon they began practicing. At 2:30pm the Choir Festival was opened with the Lord's Prayer, as well as the America, Canadian and Serbian anthems. Then the official representatives were greeted: program director Laura Trbovic, Secretary of the SSF Petra Koprivica, and assistant secretaries welcomed the choirs and guests; Katy Petkovic, president of the host choir “Mita Topalovic” greeted the choirs and all present; Aleksandra Starcevic and Bunny Dauer, chairs of the Festival Committee also offered their greetings; Thomas Olson, president of the Singing Federation greeted all the choirs and guests; V. Rev. Nedeljko Lunich, the local priest and episcopal dean for Chicago greeted the SSF board members, the local choir and all visiting choirs, wishing them a nice stay in Joliet. He pointed out the significance of the Singing federation and the local church choirs for the liturgical life in the parish. He called upon the priest to support to their choirs and to take part in their activities. The SSF granted the “Adam Popovich Director's Award” once again this year to Alexandra Starcevic for her outstanding contribution to the Serbian Singing Federation and other areas. 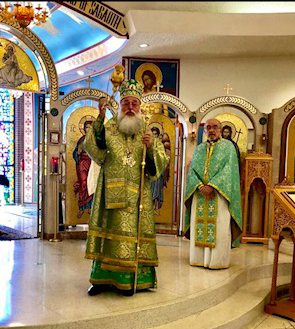 Since the choir director Alexandra Starcevic, whose maiden name is Jovanovic, marked her 25th year as choir director at the St. George in Joliet the parish, in gratitude for her selfless contribution to the choir and parish of St. George, gave her an icon of St. Kasijana of Petersburg, the Krsna Slava of the “Mita Topalovic” choir. Fr. Lunich, in giving her the icon, expressed her dedication, zeal and love for the choir and the St. George parish, as well her role in the Serbian Singing Federation, being honored with directing the all-Serbian children's choir. He also praised her parents Radovan (the pillar of the “Mita Topalovic” choir) and Darlene Jovanovic, as well as her sister Rebecca and Kristina with their families. Though his eyesight has weakened considerably, Radovan continues to sing to the glory of God. We pray for his health and that, through God's mercy, his sight might restored. After all the greetings the choirs performed. Ten choirs performed on Saturday during the first part of the concert lasting from 2:30 to 5:30. Choirs from Joliet, IL; Mississauga, Ontario; Steubenville, OH; Junior choir from Joliet, IL; “Tsarica Milica” women's choir from Pittsburgh, PA; Kansas City, Kansas; Lansing, IL; “Tsar Lazar” male choir from Pittsburgh, PA; Phoenix, AZ and Aliquippa, PA. The Aliquippa choir dedicated to the newly departed V. Rev. Stavrophor Stevan Stepanov, Protinica Ana Stepanov was present at the concert. The male choir “Tsar Lazar”, founded by Prota Stevan Stepanov, also performed a composition in his honor. These were touching moments. Refreshments were briefly served from the clergy, choir directors and distinguished guests at the parish house. Afterwards, the festivities continued with a dance. Two orchestras performed, entertaining the crowd till late in the evening. 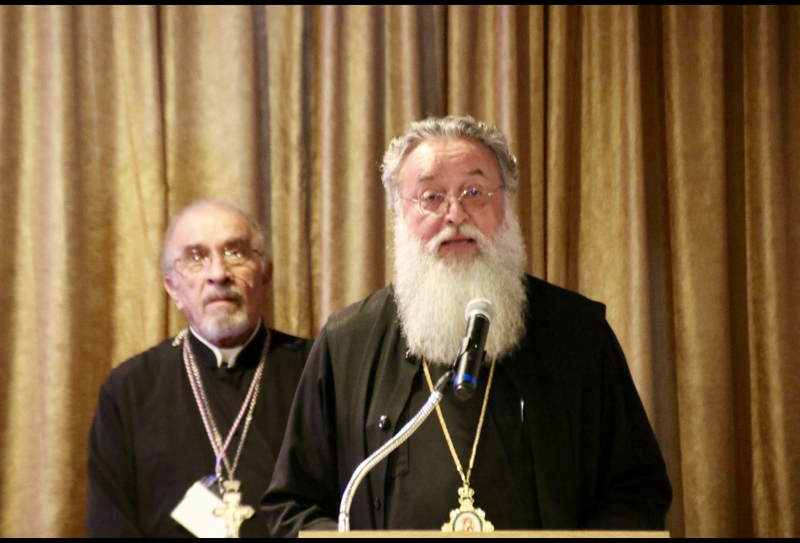 His Grace Bishop Longin served the Holy Hierarchical Divine Liturgy at St. George Church on Pentecost, May 27, 2018 with the concelebration of parish priest and Dean of the Chicago Deanery V. Rev. Nedeljko Lunich, Protodeacon Milovan Gogic, Deacon Nenad Jakovljevic, Subdeacon Zoran Stojakovic and Reader David Lakette. The St. Sava Choir from Mississauga sang the responses. Girls from the church school, led by teacher Nancy Cora, chanted the antiphons and read the Epistle. Bishop delivered the festal homily. The church was filled with people. His Grace added to the solemn atmosphere of the liturgy, which was noticed on the faces of the faithful. The faithful were filled with joy as the bishop blessed them at the end of the liturgy. The bishop had returned the day before from the Assembly of Bishops of the Serbian Orthodox Church in Belgrade. 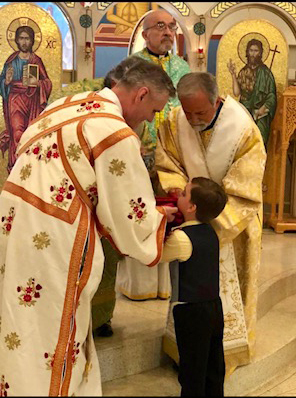 Prota Nedeljko distributed the antidoron, himself being filled with joy in seeing the faithful he has known for many years during his fifty year priestly service in America. Protodeacon Milovan Gogic and Subdeacon Zoran Stojakovic handed our little crosses and icons. After the Divine Liturgy a luncheon was served in the hall. There was plenty to rest in preparation of the second part of the choir program. The second part of the program began at 2pm with the Lord's Prayer and the singing of the national anthems. Representatives of the Serbian Singing Federation and the host choir offered words of greeting. Prota Nedeljko also greeted everyone wishing them much success. Bishop Longin also greeted the choirs, expressing his joy at seeing so many young and old singers. He promised that in the future he would try to attend as many of these festivals as he could. Upon the recommendation of Prota Nedeljko Lunich Bishop Longin awarded Alexandra Starcevic with the Order of St. Mardarije for her 20 years of work as choir director of the "Mita Topalovic" Choir, for her dedication to the church and exemplory family life. This was welcomed by a round of applause and Mnogaja Ljeta was sung in her honor. At this second part of the festival five choirs participated: Boston, Chicago, Monroeville, Lake Forest, IL, and Milwaukee. They were well received by all. After the program fellowship was enjoyed until the late hours since the following day was a holiday, Memorial Day. Besides the music, signing and dancing Deacon Nenad performed "karaoke". Clergy could not travel with their choirs as they typically do for this festival, since this year's festival fell on Pentecost. On Sunday, Fr. Nikolaj Kostur was present at the concert together with his family. Also present were Protodeacon Milovan Gogic and Deacon Nenad Jakovljevic with his wife. Also present were Protinica Ana Stepanov of Aliquippa (now residing in Medina), Protinica Zorinne Sokolovic from Cleveland, Protinica Jelena Milunovic from Chicago and Protinica Vera Vlajkovic from Boston. Members of the "Mita Topalovic" choir deserve our gratitude and praise for their excellent organization. Hopefully it will stimulate members to continue taking an active part in the choir and the church life of the parish.